A brief summary of our experiences with connecting displays with higher resolutions than 1920x1200 using the HDMI port on notebooks. Although the current HDMI standard (HDMI 1.4) actually supports displays with very high resolutions, you'll face display or graphics card problems. 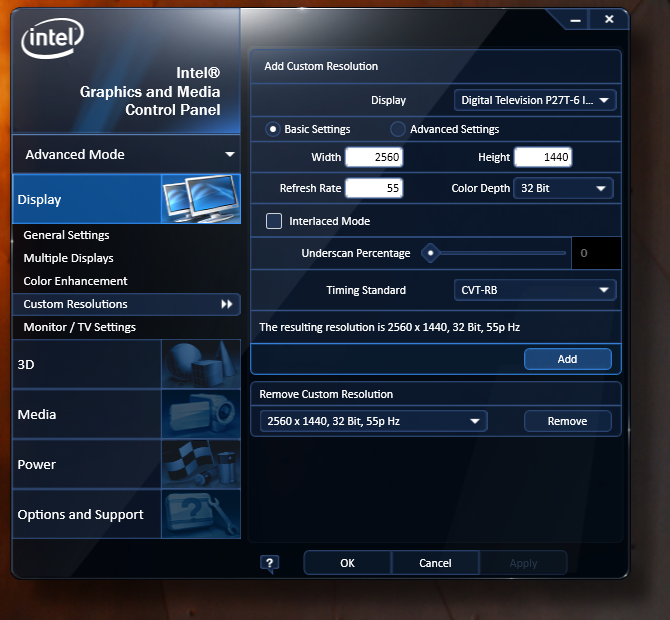 E.g., driver and hardware (single link HDMI) of the integrated Intel HD Graphics 3000 and 4000 restrict the resolution to 1920x1200 at 60 Hz and you'll need a trick to use higher resolutions. In addition, many 27-inch and 30-inch displays, e.g., Fujitsu's P27T-6 or Dell displays (e.g. U2711 or 2713HM) only report a maximum resolution of 1920x1200 via HDMI. The following article will briefly summarize our experiences and serve as a quick guide. By the way, we did not use a special cable. Unless specifically noted, we used an ordinary, cheap HDMI cable. 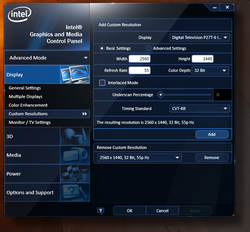 The newer Intel drivers (introduced with Windows 8) offer a new user interface that lacks the option to add a custom resolution. However, Intel bundles a tool called "CustomModeApp" with the driver that offers the possibilty to add a custom resolution. You can call it in using the Windows 8 search (by just searching for "CustomModeApp" for example). In our tests 2560 x 1440, 55 Hz, 32 Bit, CVT-RB was successfull. However, one reader mentioned that only 50 Hz was accepted with his system. In theory this method should work with all newser Intel graphics cards that use the new driver user interface (e.g. 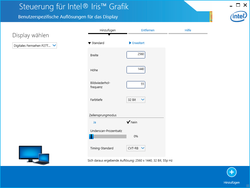 Intel HD Graphics 4000, HD Graphics 4200, HD Graphics 4400, HD Graphics 4600, Iris 5000, ...). On how to add a custom resolution with the older drivers, see the next abstract. Tested with: Asus N56VM pre-sample and Fujitsu P27T-6 27-inch display with 2560x1440. 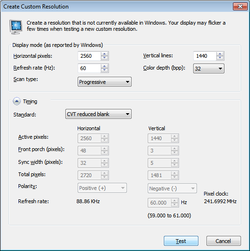 You need to manually add a new resolution to the Intel driver (Display -> Custom Resolutions) to use a resolution of 2560x1440 via HDMI. The driver complains that the bandwidth via HDMI is too low for a resolution of 2560x1440 at 60 Hz. With the "GTF" timing setting, only a maximum of 30 Hz was possible in our test. However, if you select "CVT-RB" (Reduced Blank) as Timing Standard, 2560x1440 at 55 Hz (55 p) is possible. But, it did not appear in the Windows dialog until we rebooted the computer. If it is still not listed after the first reboot, repeat the procedure. If the image is distorted or flickers heavily, it might help to fiddle around with the monitor settings. E.g. the Fujitsu P27-T just stopped flickering in "Office" mode. With the system tool of Linux only a maximum of 2560x1440 at 30 Hz (with noticeable delays) was possible. But, by means of a working windows configuration and PowerStrip you can also configure 2560x1440 at 55 Hz (with reduced blanking). Unfortunately, you can only specify modelines a multiple of 60 MHz at "reduced blanking" directly in the CVT tool. Tested with: Acer Aspire TimelineU M3-581TG and Fujitsu P27T-6 27-inch display with 2560x1440. Tested with: Intel Whitebook with Pentium B950 (HD Graphics) and Fujitsu P27T-6 27 inch display with 2560x1440. Same steps as for Intel HD Graphics 4000 (see above). Although we successfully added a Custom Resolution with "regedit" (adding 1366x768 worked this way), 2560x1440 (we tried: 30, 40, 55, 60 Hz) could not be selected in the Windows Dialog. - First go to AMD catalyst and look under Information, then Software. - Look for the 2D Driver Path. Make a note of the Path as you'll need it later. - Open RegEdit as Administrator (You must open as admin otherwise RegEdit will not save changes). - Open the folder as described in the 2D driver path. - Look for a registry file in that folder called DALNonStandardModesBCD2 click Modify then add your chosen custom resolution to the list (mine was for 1440x900 14 40 09 00 00 00 00 60 - the last two digits denote refresh rate). - Check Windows display and Catalyst Control to see your new resolution. The two notebooks are equipped with HD Graphics 3000 or 4000 graphics cards and use Nvidia Optimus for automatically switching between the graphics solutions. You simply need to follow the instructions above since the HDMI port is connected to the Intel HD Graphics in Optimus notebooks. Tested with: Asus UL50VF (despite with Optimus, the HDMI port is directly connected to the GeForce G210M), driver: 313.96 and Fujitsu P27T-6 27-inch monitor with 2560x1440. 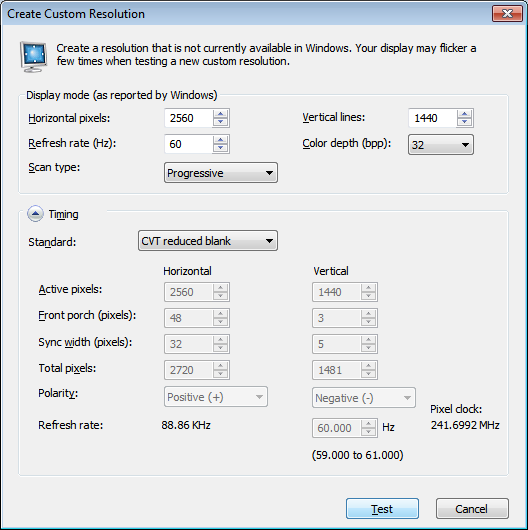 In the Nvidia driver settings, add a new resolution with "Display -> Change resolution, Customize ..., Create Custom Resolution". In our test, a resolution of 2560x1440, 60 Hz, Progressive with Timing "CVT reduced blank" worked without image problems (automatic results in image errors and flickering on the Fujitsu P27T-6). Afterwards you can select the resolution in the Nvidia Control Panel under "Change Resolution". This may put other people off but there has been a lot of work put into these by several people at notebookreview.com. Then right click the desktop and choose Nvidia Control Panel. Choose Change screen resolution from right hand menu. Make sure Dell U2713HM is selected on the left panel. Feedback, further guides, links, and reports of success, which we can add to the article, are welcome. Please use our forum to supply us with information (e.g., the comment function below).